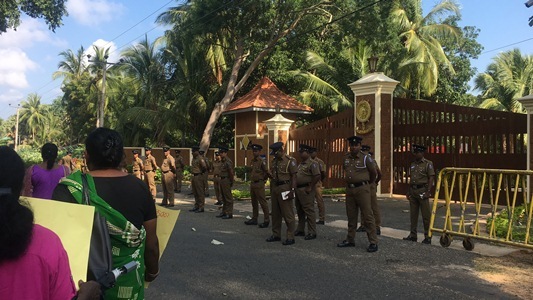 Colombo, February 4: The residents of the North Sri Lankan village of Keppapilavu began protesting opposite the Mullaithivu Security Force Headquarters (SFHQ) on Sunday (February 3), demanding that the military return the land which belongs to them. 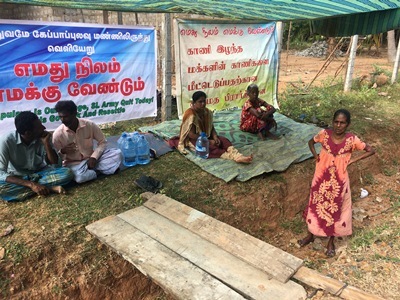 Backed by some Colombo-based NGOs, the people of Keppapilavu have been protesting for around two years demanding their lands back. President Maithripala Sirisena had promised to return all military held lands to their rightful owners by December 31, 2018. The Keppapilavu residents were assured of a solution by 25 January 25 ,2019. Disappointed when this did not happen, they threatened to forcibly enter their lands. Accordingly, last Sunday, the villagers decided to force their way into the army establishment. But the police had placed barricades around the camp preventing the villagers from obstructing the SFHQ gates. The number of protestors was relatively small but they were supported by several others who had been brought there by a certain NGO. On July 29, 2017 ,following appeals made by Members of Parliament (MPs) and local politicians in Mullaittivu District, the Security Force Headquarters – Mullaittivu (SFHQ-MLT) released 189 acres of land situated in the SFHQ-MLT Army Cantonment. The release of the lands at Keppapilavu was intimated officially to the Maritimepatthu Divisional Secretary in the presence of Mrs R. Ketheeswaran, District Secretary for Mullaittivu by Brigadier General Staff, SFHQ-MLT. Families which were living with their next of kin were able to return to their original places of residence in Keppapilavu. A similar release of 243 acres of lands belonging to civilians in Keppapilavu but used by the Security Forces in Mullaittivu, took place earlier on 25 January 2017. Shortly after that the Security Force Headquarters – Mullaittivu released lands and properties in Keppapilavu and Seeniyamottai. Further, on January 1, 2019 the Mullaithivu SFHQ opened the public road that runs across the perimeter of the SFHQ-MLT connecting Puthukudiyirippu and Vattappalai. The Governor of the Northern Province Suren Raghavan said that he asked Shanthi Sriskandharajah MP, who is a victim of war herself, to take the leadership in initiating a dialogue. “Just because some NGOs in Colombo have not taken these other issues seriously, do all those other people become nobodies? Therefore, let’s be rational. I am giving priority to these people and in return I expect them to be rational,” the Governor said. But those demanding release of the military-held lands said: “Only a few have houses there (in the military occupied lands). The others have to start rebuilding from scratch. Our schools, community centre, cemeteries and even the wells we take water from, are all within the military-held lands. We are not against the army being here, but we just want our lands back. There is land on the other side belonging to the Forest Department. The government can move the army camp to that area and give these lands to us,” said Suheenthan, a father of two. Meanwhile, issuing a statement against the actions of the police in handling the group of people who had protested demanding that their lands be released to them, the People’s Alliance for the Right to Land (PARL) said that on the morning of the 26th of January, 2019, a group of courageous and resolute women from Keppapilavu marched about two km towards their lands to demand their release by the miliary. As they walked towards the main entrance of the army camp, they were met by a large number (approx. 45) of police officers. At least five police vehicles (including a bus, lorry, jeeps and a car), were parked outside the camp gates to prevent the protestors from storming the military HQ. The local agitators were soon joined by more displaced villagers, as they stood in front of the police vehicles. PARL Coordinator Marisa de Silva said their organization is supporting the Keppapilavu residents as they are currently the only group struggling to reclaim their lands. “A group of Kappapilavu residents were scheduled to meet the President, but when they went to the meeting the President was not there. However, they had been told that the President is scheduled to visit Mulaithivu on February 11 to meet with these people. These people have been displaced since 2008 and they want their lands back so they could rebuild their lives. They have been engaged in a road-side protest for over 690 days, which is the longest continuous protest over land,” de Silva said. The Police stated that they had obtained a court order preventing the protestors from blocking the road running alongside the Mulaithivu Security Force Headquarters. The order said that the protestors could demonstrate peacefully maintaining a distance of 75 metres from the Mulaithivu SFHQ. The protestors adhered to the order and shifted their protest site outside the perimeter, having measured exactly 75 meters from the gate. But thereafter, the police had opposed the setting up of their camp on a particular side of the army HQ. The protesters argued that nowhere in the Court order was it specified which side of the HQ should be the location for the protest. After much discussion, the police told the people to do as they pleased, and warned that the police would not be responsible if any harm were to come to them. One of the protestors Ariyakala who is referred to as “teacher” said that there are 171 acres under the military which belongs to 104 families. When asked if they had deeds to prove ownership of these lands she said four of them have Swarnabhoomi deeds, 56 Kachcheri approval and the rest have permits. “Around 100 acres were under coconut and teak. We have lived there for 40 to 45 years. There are 42 fisher families who were living there too. These lands have been with our families for generations. We don’t want to leave them. There is plenty of land on the other side, and the army can move their camp there and give us back our lands. We have been protesting for over 703 days now,” Ariyakala said. Commenting on the many meetings the protesters have had with government and military officials, she said that the meeting with the Northern Province Governor Suren Raghavan was the most fruitful. While most of the focus has been on the Keppapilavu residents, a group of 83 refugees returned to Sri Lanka from Tamil Nadu last Thursday (January 31) through a process facilitated by the Colombo office of the United Nations High Commissioner for Refugees (UNHCR). Since 2009, 11,020 refugees have returned to the island from Tamil Nadu. The returnees are from Vavuniya, Mannar, Matale, Mulaithivu, Trincomalee and Jaffna. The UNHCR had provided them free air tickets. Another 3000 refugees are expected to return home next week. They are also provided dry rations for six months until they get their lives back on track. A livelihood allowance of not more than Rs. 100,000 per family is also given. In some areas, those who have been given lands and resettled are not happy with other refugees returning from India. They fear that once they are given lands and resettled, those already living in these areas would have less land to cultivate. Settling the land issue and resettlement of the displaced are no easy tasks for the government. But, in some instances, there is a need for some form of compromise between the government and the affected people. As Northern Governor Suren Raghavan said, all parties concerned need to come up with the “best solution” and also the “next best solution” in order to strike a compromise, resolve these disputes and get on with the greater task of resettling the over 65,000 others still languishing in IDP camps in Tamil Nadu and over 30,000 others living with relatives and who are looking forward to returning home.